Sleeps 8 plus. Newly renovated with 2 MASTER SUITES on the main floor and 2 other bedrooms with 2 beds each upstairs. Perfect for 2 families or a group of friends. Minutes to Stratton by Shuttle bus provided for free, close to Bromley, and Manchester for winter activities, designer shopping and first class dining. Enjoy snowshoeing the Appalachian trail, Sking the slopes at one of 5 nearby resorts. Open living, Hot tub, 2 fireplaces, smart TV's, WIFI! The warm and woodsy lofty retro-modern interior warm the body and soul after a day on the trails. The unique layout of this home puts distance between the bedrooms for privacy but keeps the conversation going with its open living floor plan. The open air hot tub is a perfect way to soothe the soul. For those wanting a little time on their own, the second recreation area is a cozy gaming loft with dueling XBox 360's. There are 4 bedrooms: 1 master bedroom with queen bed, fireplace and ensuite full bath, 1 second bedroom with queen bed and a private ensuite bathroom newly renovated. A 3rd bedroom with 2 twin beds and full bath just outside the bedroom door. And one more bedroom on the other side with two twin beds. Go skiing at any of the 5 ski mountains within a 5 to 30 minute drive or hop aboard the free Strattonwald shuttle get dropped off at the lift line in minutes. Come back to a roaring fire in one of the 2 fireplaces or the outdoor fire pit. Grab your cocktail and swim suit then submerge yourself into the open air hot tub with a friend and compare your life stories or brag about your savvy purchases from the designer outlets in Manchester down the hill. If you'd rather stay dry you can also loosen up your tight muscles in the cedar lined sauna. Hungry after a day of working out? Make a quick change and hit one of the many acclaimed restaurants just minutes away. This house is well equipped for your stay with firewood, bedding, towels, hair dryer, coffee, etc. Forgot a toothbrush? It is there. Need hand warmers? They are there. No need to chase down a property manager at midnight to get your key, the door is programmed with your own personal key code. Simply arrive and punch in your code to enter a home that has been pre-heated and ready for your enjoyment. There are two living areas, a main living room with open floor plan to the newly renovated fully equipped kitchen, and a gaming loft with level 2 gaming via xbox 360. Bedrooms are spread out and private should one want to retire early. There is plenty to keep one awake and entertained with broadband wifi, smart tv's in every room including a home theater with Hulu Live, Netflix etc already activated for your enjoyment. The home has large windows and skylights throughout providing a sun drenched experience. Both Master suites have high quality heated mattresses and 600 thread count organic Pima cotton hotel quality linens. A variety of pillow choices and high quality down comforters ensure a restful night of sleep. Once of the master suites has its own fireplace with provided firewood. This home has everything you need to have a great time. CHEERS!!! I am a photographer of people. I freelance for magazines shooting fashion, celebrity, and beauty subjects. I love hosting and making people happy. I like making a beautiful space and sharing it with others. This house has everything you could imagine needing for a beautiful getaway. The proximity to Stratton with free shuttle and the amenities make this a must see. This house has both a sauna and hot tub. There are also wood burning fireplaces in the living room and bedroom. The house is stylish, mountain lux and memorable. toilet, shower, bidet, This bathroom is well appointed with Porcelanosa fittings. One bathroom is newly renovated and luxurious, the others are clean and fresh. I am in the process of adding another full bath to the guest room to make it a full suite. It is half finished and may be functional this winter. Stratton Mountain Resort is 3 miles away. There is a swimming lake in addition to the pond on property. It is located at the end of Strattonwald Rd. only a mile away. A nice walk to the beach is possible. There are also tennis courts there. Stratton Mountain is visible from the living room. seasonal air conditioning is provided. There are full sets of linens for every guest including towels specific to the hot tub. There is a large capacity washer in the laundry room off of the master bedroom. There is enough parking for 10 cars. There is a full, clean and empty refrigerator ready for your groceries. There is a fully functional kitchen with chef like stove including 4 burners with warming zone, and 2 ovens. There are 2 ovens, I believe both will convect. There is a combination k-cup coffee maker with provided k-cups for your stay. There is also a full coffee pot that can be programmed. There is a 2 slot european toaster that actually toasts well, unlike the "safe" toasters sold today. You should find, coffee, dry creamer, sugar, salt, pepper, some spices and a few other random things. Be prepared to shop and supply food and drink for your stay. There are new microwave safe place settings for 12 formal dining places. There are plenty of cooking and serving utensils and dishes. The kitchen has a fresh remodel and new floor. It has a food processor, waffle maker, blender, toaster and most everything you need to make a full meal. There are flat screen tv's each equipped with apple tv in every room in the house. The living room is connected to a surround sound audio system. Live tv is accessed through HULU LIVE app. and more. The dvd player is connected to the living room home theater system. There are a few books around for your enjoyment but you may want to bring your favorite. Although with all the amenities the house has to offer you may not have time to read. There is a dart board, board games and digital gaming as indicated above. There are also adult games to be played late into the night as well as a ping pong ball and cup. See the video game section, there are also board games for fun and adult games for even more fun. Music can be accessed through the apple tv through any music app available. There are dueling xbox 360 game consoles located in the loft. Situated next to each other the kids can combat each other side by side with headphones and microphones between them. There is a 4 person rubber inflatable boat that can be provided with advance notice. There are 2 paddle boards for use on the strattonwald pond. Launch from the beach and explore the inlets to the pond or simply paddle to the sun tan raft and layout all day. Strattonwald community tennis courts are available for your use, there are 3 rackets provided. The house is nearly walking distance to the Stratton golf course. The property is level and entry would be easy through the side door. Snow would need to be shoveled to make access easy if there is snow. This is a communal beach on the Strattonwald pond. The water is clean and the scenery is beautiful. The pond on property can be waded into but is still being conditioned for real swimming. There is a new hot tub installed this summer with a 4hp motor and enough room for 5 or more, it includes a lounger and deep seated back massage system. Each seat jetted for specific areas of the body. We had a wonderful time at the Stratton house! Chris was attentive to our needs and was very accomodating. The house is nicely done with every needful thing plus! Everything was very clean. Having the hot tub and sauna felt luxurious! It rained all day Tuesday but the fireplace kept us warm and cheerful. The many games kept us entertained. We loved the electronic dart board! Our only suggestion is this property not be listed as wheelchair accessable. The doors are too narrow and bathrooms to small to access. The step from the patio to the house is too high without a ramp. Otherwise the house is amazing! Our party of 8 absolutely loved the Stratton Ski House. Located not far from Manchester Center where there is plenty to do. The home was very clean and comfortable. We loved being able to sit around either of the two fire pits on the property. The hot tub and sauna were perfect to relax in. We couldn't of asked for anything more. Would love to go back again sometime. We had a great stay here! It was a perfect location ... close to everything. The house had everything we needed and lots of extras . The hot tub was wonderful as well! Chris was amazing to deal with and we will be back for sure ! What a GREAT place. Everything you could want. This house has everything you could want in a vacation home. 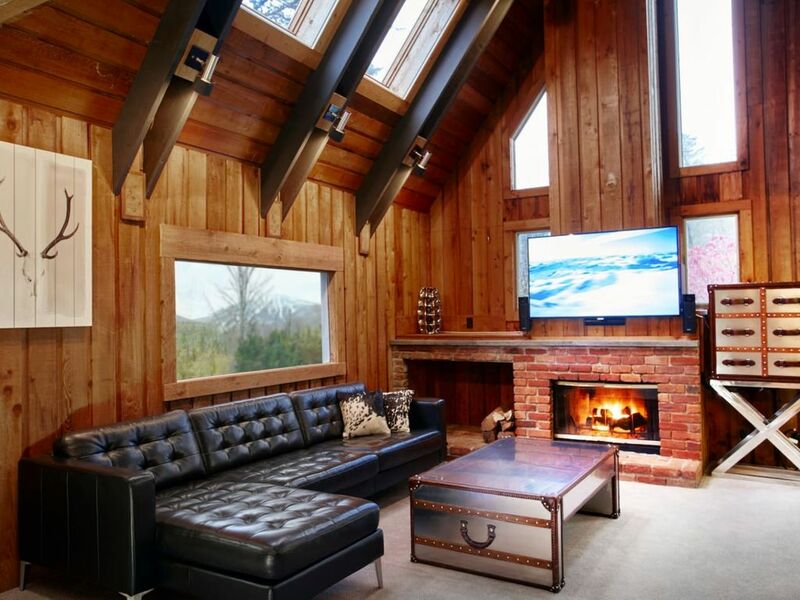 It looks like a wooded cabin but feels like a swanky getaway. The hot tub is so nice to sit in while looking at the stars, the sauna smells like cedar and is very therapeutic, the entire place is wired with high tech, from the level 2 gaming set-up to the apple tv in every room, the bathroom seat is even wired for warmth and has a bidet built in. Love this place. Thank you please come back anytime. The house is very comfortable and well maintained. It is very clean which is important to us. The owner put a lot of thought and detail into decorating and making it comfortable for guests. He was extremely nice to deal with and very accommodating. We would definitely stay there again and I would recommend to friends.